What are the BTU I should be looking at? Brand New , package haven't been opened yet. Installation I have the contractor can do for you . Ur living room requires ard 12k btu. 18k will be very safe. 22k is oversized. The energy bills is different from a 9k compared to a 12k or 18k. Its ok to upsize 1 level up as it 9k upsize to 12k. But not 9k to 18k, as the compressor will cut off too fast before the desired comfortable humidity level is achieved. Terumo, yes aircon contractor says he will make good if leak is due to aircon. But my concern is whether they will do a proper job and solve issue because I suspect another aircon is having same issue! So I am very worried it is a question of them doing the installation incorrectly and repeating the mistake elsewhere Really hope they fix it properly now. Would like to get your comments on whether there is any particular brand/type and thickness of insulation for the concealed air con pipe? Usually i see contractors using Armaflex 1/4 thickness insulation. My aircon have finally seen her final days. Need a new System 2. Anybody to recommend ??? Just realise in Sg you guys why needed piping upgrade from G23 to G22? 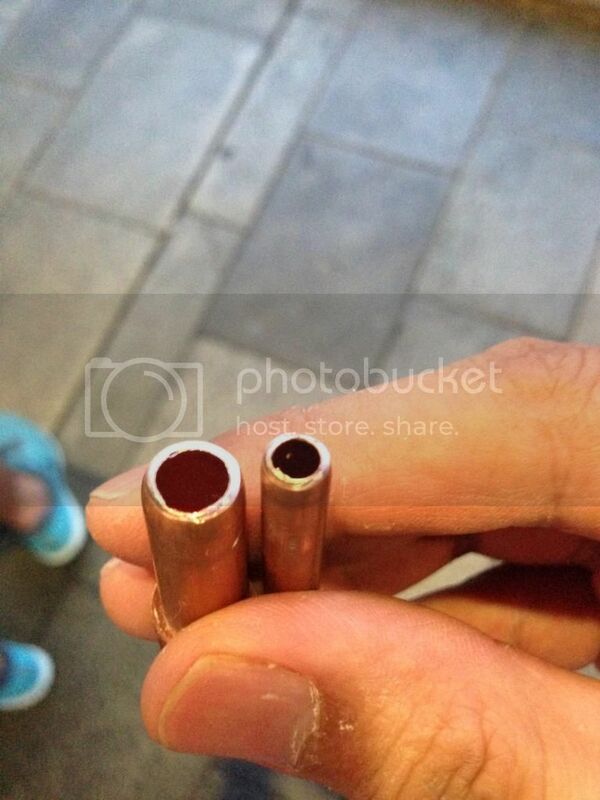 These is thick enough for G23, in M'sia I am not sure what grade of the copper pipe size, just enough to install non inveter only. See at the photo really thick on G23. Was quoted $3,199 for Starmex Sys 3, 2 x 9K & 1 x 18K, bracket $150 & $180 upgrade from Armaflex 3/8" to 1/2" & copper pipe from gauge 23 to gauge 22. But is GC service worth the higher price? Just want to have a peace of mind for the next 3~5 years. Air-conditioning for 5 rm flat - any recommendation please? I'm a newbie here and would like to seek for your opinion for the air-con installation. My friend is suggested me to install Mitsushi Inverter System 4 for Master/Normal/Study room. As for Living room will be installed 1 single unit. The usage in Living room is quite minimal. In fact, i'm more prefer taking Daikin. Please advise which brand is recommended for energy saving and suitable for flat. I am no air con guru, but why not a system 3 (MBR and normal room) + a system 2 (study + living) with 12 or 18k btu for the living room unit. May I know if it's worth it?